Inherit the night and reclaim the power that is rightfully yours! Fight off the vampiric hordes that threaten the safety of humanity, or join their undead ranks in your pursuit of unholy strength. Will you vanquish the blood-sucking villains that seek to rule the streets beneath the cover of darkness? Or will your undead heritage prove that you are more monster than mortal? While others sleep, you find renewed vigour beneath the starlit sky, and whether you seek the blood of the living or the dead, one thing remains certain: the hunt is on. A thorough dissection of vampirekind, including tactics for encountering these undead fiends and properly sending them back to the grave. Advice and guidelines on playing vampire characters in a vampire-focused campaign, as well as new traits for every type of vampire. Traits and alternative heritages for dhampirs - the half-undead, half-mortal progeny of vampires. New feats, equipment, and spells to vanquish undead foes and compel the living to submit to your sanguine will. 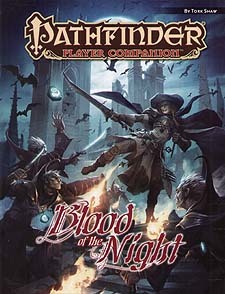 A new rule system capturing the hunger of vampire characters, who must sup on the living in order to survive.